When you want the best home for your Scandinavian stamp collections, ask for Stender Albums. Stender Albums have been crafted in Denmark since before WWII and have an excellent reputation. They are the only albums available for all the Scandinavian countries that are designed and made in Scandinavia. This makes a difference -- the album page designs simply make more sense! I urge you to compare Stender Albums with any other album -- I think that you will be impressed with Stender's quality and my low prices. The paper and printing are exactly the same for all three album styles: the only page difference is that the Superb albums have clear mounts already on the pages while the Deluxe and the Quality albums do not have mounts on the pages (either apply your own mounts or use hinges). The binders are the same for the Superb and Deluxe albums (pictured at right with slip cases) while the binders for the Quality albums (Norway pictured below, left) are a different single color for each country. Images of representative pages are shown at the bottom of this page. WITH MOUNTS. "Hingeless" with Hawid-brand clear mounts already in place. The highest quality Stender album. 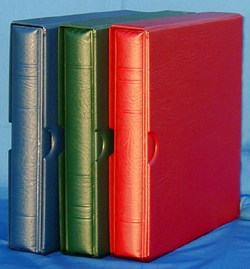 An attractive padded binder is included (your choice of Blue, Green, and Red) and are the same as for the Deluxe albums. Matching slipcases are available separately. 2111 ÅLAND Superb Hingeless Album, including binder. Add slipcase / dust cover. Also available as pages only if you want to add these pages (with mounts) to an existing Stender binder. 2331 DENMARK Superb Hingeless Album, including two binders. 2033 DENMARK, FAROE, GREENLAND, DWI, & SLESVIG Superb Hingeless Album, including four binders. 2434 FAROE Superb Hingeless Album, including binder. 2635 GREENLAND Superb Hingeless Album, including binder. 2236 DWI & SLESVIG Superb Hingeless Album, including binder. 2552 FINLAND (including Aunus, Karelia, & North Ingermanland) Superb Hingeless Album, including two binders. 2555 FINLAND & ÅLAND (including Aunus, Karelia, & North Ingermanland) Superb Hingeless Album, including three binders. 2777 ICELAND Superb Hingeless Album, including two binders. 2837 NORWAY Superb Hingeless Album, including two binders. SWEDEN is currently not available in a Hingeless Album. If you are seriously interested in a Sweden Hingeless Album, please let me know. 2082 SCANDINAVIA Superb Set A complete set of Superb Albums, including #2033, 2555, 2777, 2837 contained in 11 binders. Total value $2966.00. PLEASE SPECIFY BINDER COLORS DESIRED FOR EACH COUNTRY. This set does NOT include Sweden; Sweden is not yet available in Superb (with mounts). To complete your full Scandinavia set, order #2926, Sweden Deluxe. WITHOUT MOUNTS. The pages are the same as the Superb albums but without the mounts. An attractive padded binder is included (your choice of Blue, Green, and Red) and are the same as for the Superb albums. Matching slipcases are available separately. 2102 ÅLAND Deluxe Album, including binder. 2341 DENMARK Deluxe Album, including two binders. 2043 DENMARK, FAROE, GREENLAND, DWI, & SLESVIG Deluxe Album, including four binders. 2444 FAROE Deluxe Album, including binder. 2645 GREENLAND Deluxe Album, including binder. 2246 DWI & SLESVIG Deluxe Album, including binder. 2522 FINLAND (including Aunus, Karelia, & North Ingermanland) Deluxe Album, including two binders. 2523 FINLAND & ÅLAND (including Aunus, Karelia, & North Ingermanland) Deluxe Album, including three binders. 2724 ICELAND Deluxe Album, including two binders. 2829 NORWAY Deluxe Album, including two binders. 2926 SWEDEN Deluxe Album, including three binders. 2081 SCANDINAVIA Deluxe Set A complete set of Deluxe Albums, including #2043, 2523, 2724, 2829, 2926 contained in 14 binders. Total value $1657.00. PLEASE SPECIFY BINDER COLORS DESIRED FOR EACH COUNTRY. WITHOUT MOUNTS. The pages are the same as the pages in the Superb (with mounts) and Deluxe (without mounts) albums. The only difference is that the Quality Album has a less plush binder, available in only one color per country. The binder is gold-stamped with the country name. ÅLAND Quality Album, including binder. Also available as pages only if you want to add these pages to an existing Stender binder. 2311 DENMARK Quality Album, including two binders. 2012 DENMARK, FAROE, GREENLAND, DWI, & SLESVIG Quality Album, including four binders. FAROE Quality Album, including binder. GREENLAND Quality Album, including binder. 2512 FINLAND (including Aunus, Karelia, & North Ingermanland) Quality Album, including two binders. 2513 FINLAND & ÅLAND (including Aunus, Karelia, & North Ingermanland) Quality Album, including three binders. 2714 ICELAND Quality Album, including two binders. 2815 NORWAY Quality Album, including two binders. 2916 SWEDEN Quality Album, including three binders. 2080 SCANDINAVIA Quality Set A complete set of Quality Albums, including #2012, 2513, 2714, 2815, 2916 contained in 14 binders. Total value $1433.00. The smaller countries are available as PAGES ONLY SETS to be added to an existing Stender binder. A Page Set is available for Denmark Christmas Seals without mounts. ÅLAND Pages ONLY set. Can be added to an existing Stender binder. Also available as complete album. FAROE Pages ONLY set. Can be added to an existing Stender binder. GREENLAND Pages ONLY set. Can be added to an existing Stender binder. DWI & SLESVIG Pages ONLY set. Can be added to an existing Stender binder. DENMARK CHRISTMAS SEALS Pages ONLY set. Can be added to an existing Stender binder. Currently not available WITH mounts. 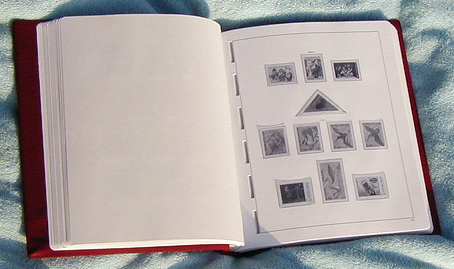 Expand and personalize your collection with blank pages. Easily include covers, postal stationery, booklets, postmarks, varieties -- anything you enjoy. Available in packages of 10 or 50 pages; offered in two styles. The border-only pages match the style of the pre-printed album pages. Will fit any Stender binder. The underprint is very light and is quite helpful for straight and centered mounting of stamps and covers. The gray-underprint pages do not have a border frame line. Will fit any Stender binder. Every Stender album comes complete with one or more binders. However, if you plan on expanding your collection with blank pages for additional items, go ahead and get an extra binder now while you can be absolutely sure of a precise dye-lot color match. Handsome, padded simulated leather appearance. Will fit any Stender pages. Each country of the Quality-style binders is gold-stamped with the country name and is in a different (single) color. The Quality-style binders are sturdy and nice looking, but not as plush as the Superb/Deluxe binders. Will fit any Stender pages. There are also generic binders available with "STENDER ALBUM" on the spine for use with non-country specific material. Gold stamped "ÅLAND" on spine. Gold stamped "DANMARK" on spine. Gold stamped "FÆRØERNE" on spine. Gold stamped "GRØNLAND" on spine. Gold stamped "FINLAND" on spine. Gold stamped "ISLAND" on spine. Gold stamped "NORGE" on spine. Gold stamped "SVERIGE" on spine. Discontinued color. Subject to stock on hand. Every Stender album comes complete with one or more binders. However, if you want extra protection for your album, I recommend getting slipcases for the binders. If you plan on getting slipcases someday, go ahead and get them now while you can be absolutely sure of a color match with your binders. Slipcases are currently only offered to fit the Superb/Deluxe binders. Handsome, padded simulated leather appearance. Will fit any Stender Superb/Deluxe binder. Denmark first page. Note that the major color differences are included. More specialized varieties, that are of interest to only some collectors, are included in a group of "variety" pages. Iceland page. Showing presentation of modern issues. Sweden page. In the case of stamps like the typical Swedish booklet panes and pairs, Stender albums show both the complete pane/pair and the component singles. In the example below, the first two rows contain coil stamps. The third row contains both the pair and component singles of one issue. The remainder of the page shows a block and its component singles.